The teenage years are a transition in a young person’s life- a temporary phase, when they change from being a child to an adult. This is actually move from dependence to independence, where there is less dependency on the family and more exposure to the entire outside world. This is the time to understand teenagers. Similarly, the role of their parent also changes from providing the basic protection, nurturing care and instructions, to the role of preparing the child for their independence along wilth the ability to survive in the world outside their family. The parenting style at this stage changes to provide negotiations, contracts,advice and many more thing to their teenage children. Every family goes through stress and conflict as children grow into their teens-this is actually a normal part of growing up. Problems like mood swings, repel, arrogant attitudes, cluelessness and a wide range of emotions are part of their growing experience. The expectations of parent’s and the teenager’s inability to live up to them are the major sources of disagreement. Understanding teenagers better when their emotions are “out of control”, leads their parents to lesser disputes with them. You should know the below mentioned guidelines for different ages. 11-12 years –This Can be very emotional and moody. Their self-esteem may take a sharp drop that would probably returns back when they are 18 or 19 years. 13-14 years – This Can be excitable, irritable, and more likely to explode than to control their emotions. 15 years – It is actually more moody, withdrawn, and stages to “cover up” their feelings. 16-17 years –Here they Often calm and settle down into a more adult pattern of behavior. They begin thinking about abstract ideas like love, honesty, and justice. While understanding teenagers, you need to take a look of the following. Teenagers feel closely connected with the way people feel about their body. They often feel uncomfortable about themselves with their body, if they are started thinking that the general perception is not good. Girls begin changing inside as early as 7 years old, and boys at around 9 years. Their physical maturity occurs long before their emotional maturity and hormones that trigger growth can also cause mood swings. The onset of adolescence is marked by puberty. Physical signs of puberty for girls begin with breast development and the onset of menstruation,whether for boys it is basically their chest and facial hair, deepening of their voice and the signs of increased awareness of sexuality. They have uneven growth in parts of their body that sometimes makes them clumsy and self-conscious. Teenagers are more sensitive to weight and their general appearance. Their hands and feet grow much faster than their arms and legs actually. Parts of the face grow at different rates, and almost all teenagers have skin problems like acne or “zits”, which are related to their hormone changes actually. Teenagers feel unsecure about themselves and are convinced that everyone is looking at them. 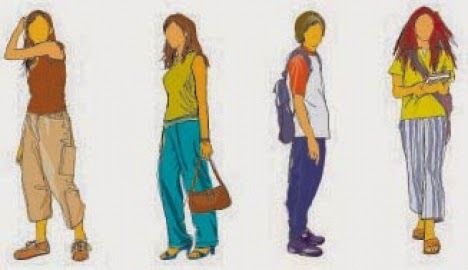 They wish to look like and dress like other teenagers around them or their friends. They spend a lot of time worrying about their look and often feel a lot of stress. Teens believe in “magic” – that they will be protected from all the bad things that happen to others. Growing teenagers have so much on their plates like sports, school, friends and other teen drama. Adding in unfair, mean or tough parents just adds to their stress. Teenagers need a supportive environment around themselves and a well-structured, stable, predictable guidelines as they are so unstable themselves. They experience less stress if their parents are loving, caring, clear, consistent, fair, and firm. Teenagers may look grown up but they can't think similar to an adult as they lack good judgment and maturity. They believe they are unique and started rejecting the values and beliefs of their parents. They prefer spending their quality time with their friends rather than their family, though once they become adult most of them return to their parent’s values. As a parent whenever your teens need you, be sure to always ready to give them a friendly ear and hear them out. According to a Frontline report on the teenage brain – the problem of teenage mood swings is cause of hormonal swings that affect the frontal lobe. This part of the brain is still growing in the teenagers to help them regulate their emotions and reactions to stress, thus it is not well developed to contain the mood swings, but eventually it would all get alright. You must let them be moody, restless, or sullen as they like, cause they have ownership of their feelings and we can't deny them their emotions. However, a line needs to be drawn if it makes everyone else miserable, if they turn disrespectful and don't want to participate in the family or do the required chores. As a parent, don't let mood swings scare you away and stop you from being a parent. You should continue to interact with your teenager and ignore the moodiness as much as you can. Parent’s should understand that teenager’s brains are on the way to fully develop and some parts of the brain which are responsible for planning, prioritizing and logical thinking yet not fully developed untill they reach into their 20’s. Thus, it may be tough to get through to your teen the importance of things like getting good grades or preparing for college. Understanding teenagers is an uphill task, as they are a jumble of emotions. Their hormones keep changing and whether they are tring to separate themselves from childhood and make their way into adulthood, this could be a very confusing and challenging experience for them. To become a positive parent you should understand the changes your child is going through and try to make things easier to them. Even though there are some hard times while understanding teenagers through their growing stages, there are some delightfully fun and happy times which seem to make parenting teenagers worth all the trouble. As long as you love your teenager no matter what and how they are and support them through their struggle and growing years, it will make their troubles and burdens much more easier. If you are having a teenager do share your experiences, the ups and downs you have faced during their growing years with us through your comment. Wow, those things are actually helpful. Thank you for sharing them. There is so much good information here. My step-son is 16, so he is starting to calm down....A LITTLE. He is still kind of moody, though. Hopefully not for much longer. I have a moody teenager and I have to remember that he's a teen and to not take it personal. This is a great article to explain a teenagers development and what to expect. I have a 10 year old who is beginning to enter this cycle. I often feel like I just don't know what to do about some of his mood swings. Then i try to sit and remember my own teenaged years and it helps me relate to him better. This article will help even more. This is some really good information. My kids are both calming down from their teenage years, but we have been through all of this. The teen years are probably the most difficult both for the teens and for their parents. There is some very good advise here--thank you. I really appreciate the reminder that teenagers are not adults yet. My boys are still little, but I look at them and imagine I know just the way they'll be 10 years from now. Hopefully I'll always remember these things. My son will be 17 tomorrow and does not fit this mold at all. He prefers to stay home because so many kids drink and do drugs, he does not want to even be around it and get caught doing something that will ruin his future. It is the craziest thing but I do not mind at all. Oh my. It can be really stressful dealing with teenagers. They do not know right from wrong, up from down :) Sometimes it is hard to believe that we all went through that phase. The teenage years are so difficult, great information! I think teenage years are the hardest since you're stuck in a phase that you are neither a kid nor an adult. Some of those stages are tougher than others, for sure. I remember when they circle back and want to be pals again though! Working through some of those is challenging, luckily they stay good kids though, and still have so much to offer in the family. I love how excited about the future they are, to them truly anything is possible (and they're right!). My sons are adults now but those teenage years can be oh so tricky. You have to find a balance on how to approach and handle different issues and they feel their oats and become more aware of the world around them. This is great info for parents to have. These are definitely all true. I remember being a teenager (not that long ago since I'm only 23 LOL) and going through all of those stages at those ages. My daughter is six years old. Not looking forward to the teen years! I have a few years before needing this guide, but as a female who was once a teenager, you have it spot on! so much to worry about and so much attitude! I have a teenager and boy oh boy is it rough! Its been quite a ride. I agree that the teenage years is somewhat difficult. You're expected to act as an adult but people are still treating you as a kid. Anyway, I'm past that stage already but I actually miss it. How I wish I can turn back time and be a teenager again. Not looking forward to the teenage years.